Truly standing the test of time, tuberous begonias have been a favorite of gardeners for years. Characterized by their bright, showy blooms and ability to grow and flower in the shade, begonias make wonderful additions to the garden border as well as containers and hanging baskets. Most begonias grow in the height range of 6-14" and come in many different varieties specific to the flower form: double, ruffled, picotee, roseform, and hanging basket. Begonias do best in areas where they receive some bright light but no direct sunlight. Many avid begonia gardeners like to start them indoors during the late winter months to give them a jump-start on the growing season. Once moved outdoors, begonias can flower all summer long right up until the weather turns cold. Due to their "frost-tender" nature, begonias should be lifted out of the ground in late fall in areas where the ground freezes. 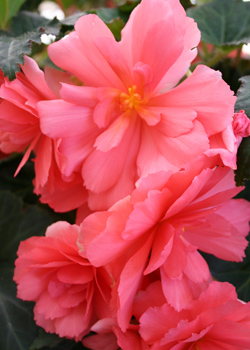 Begonias are typically planted in the late winter/early spring. As mentioned above, starting them indoors during the late winter months can be very beneficial in giving them a head start on the growing season (see instructions for starting begonias early below). 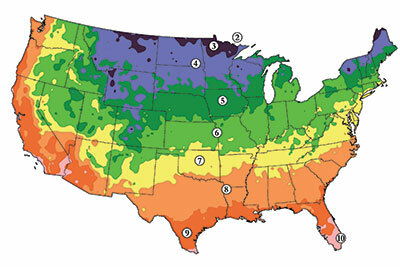 Choose a planting location that is somewhat shaded, receiving indirect bright sunlight if at all possible. It is very important that the garden bed or container you choose has good drainage as begonia tubers are susceptible to rot if allowed to sit wet too long. Depending on the variety, space begonias approximately 6-12" apart according to how full you would like the garden or container to appear. Plant the tubers with the concave (depressed) side upwards, just below the soil surface. Planting them too deep will result in excessive moisture and rot. Thoroughly soak the area with water once the tubers have been planted. Continue to water throughout the growing season, being careful not to provide too much moisture. Ground should be allowed to just slightly dry out in between watering. 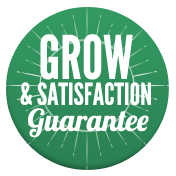 Fertilizer plants once per month if desired with a well-balanced water soluble fertilizer while actively growing. 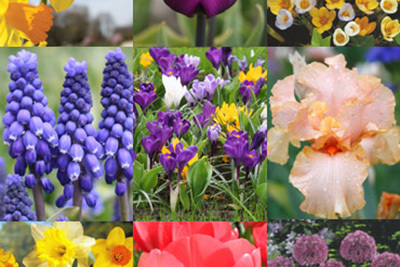 Remove finished blooms to maintain a clean appearance and encourage reblooming. Allow plants to continue growing up until the first frost. This enables them to produce food for next year's growth. If planted in containers, force the bulbs into dormancy by gradually withholding water at this point. 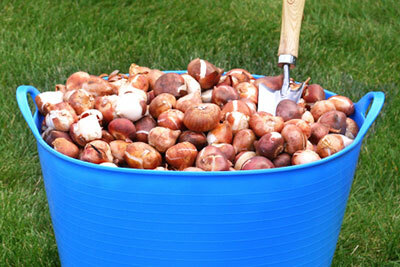 Gently dig bulbs out of the ground and allow them to dry out on a cool, dry surface, such as a screen, paper bag, or garage/shed floor. When the stems break free from the bulb, dust off any extra soil and allow tubers to cure in the sun for 4-7 days. Store the tubers for winter in open flats containing dry peat moss or sand. Place flats in a dry place which remains consistantly below 55 degrees but does not freeze, such as a cellar, basement, or garage. Replant in late winter/early spring according to the above instructions. Fill seed trays, flats, or small pots with a well-drained soil. In late February or early March, plant the tubers (concave side up) just below the soil level. Soil should be somewhat moist. Once substantial growth has formed and leaves have begun to appear, transplant plants to an outside container or garden.